Rep. Mitzi Johnson (D-South Hero) is sworn in as House speaker Wednesday by Secretary of State Jim Condos. 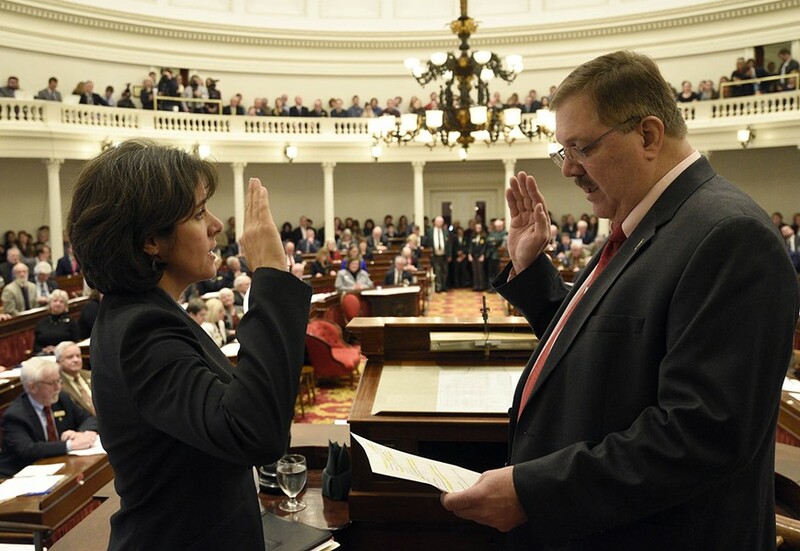 Rep. Mitzi Johnson (D-South Hero) won an easy victory as the new Vermont House speaker Wednesday, and she immediately made her mark by shifting members’ committee assignments and duties. Johnson won the position — earning her broad power to oversee the 150-member chamber — by a 100-50 vote over Rep. Linda Myers (R-Essex). Johnson replaces Shap Smith, a Morristown Democrat who was speaker for eight years before not seeking reelection. Myers went into the race knowing she had virtually no chance. Democrats hold a strong majority, with 83 seats. The vote count meant, however, that Myers was unable to win the support of all 53 Republicans, despite indications from her caucus that she would. “That I found disheartening,” she said afterward. As she took hold of the House gavel, Johnson acknowledged her partner, parents, sister and niece watching from the chamber’s balcony, but she took little time to relish her victory. The 46-year-old former Appropriations Committee chair, known for her policy prowess, got to business making key changes to House committees. She chose not to upend any sitting committee chairs, but altered the makeup of many committees as well as the issues some oversee. She signaled an interest in giving greater attention to technology projects with a reconfigured Energy and Technology Committee. For years, she noted, lawmakers have expressed angst over the lack of oversight of costly IT projects. The committee will zero in on that. The eight-member panel, to be chaired by Rep. Steve Carr (D-Brandon), will also oversee energy issues, including the perpetually dicey area of siting solar and wind projects. Carr said he’s no IT expert but has been following the issues all four years he’s been in the legislature. “I probably know more than most people but I don’t know squat,” he said. Carr said Johnson gave him no marching orders on energy issues, including about how to respond to incoming Republican governor Phil Scott’s plans to push for a wind moratorium. “We have to try and determine that,” he said. Johnson moved natural resources issues to the purview of a reconfigured Natural Resources, Fish and Wildlife Committee. That panel, chaired by veteran Rep. David Deen (D-Westminster) will have broader oversight of issues surrounding Lake Champlain cleanup. Johnson also took mental health issues from the Human Services Committee and paired them with overall health care issues in the Health Care Committee. She granted her powerful former seat as chair of the Appropriations Committee to Rep. Kitty Toll (D-Danville). Toll’s sister, Sen. Jane Kitchel (D-Caledonia) is chair of the Senate Appropriations Committee, making for a powerful family bloc. “It’s not ideal, but I really looked at who is the best person in the room,” Johnson said. She dispatched Myers, her speaker foe, from her seat as vice chair of the Corrections and Institutions Committee and moved her to the Commerce and Economic Development Committee. Johnson said it wasn’t in retaliation for Myers’ speaker campaign, but because she wanted GlobalFoundries, which has a facility in Essex, to have a hometown voice on the panel. “I will accept that that’s her reasoning,” Myers said.